Take your wireless charging experience to the next level with the Fast Charge Wireless Charging Pad. 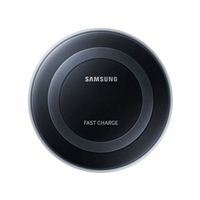 The wireless charging pad allows you to charge your Galaxy Note8, Note5, Galaxy S6 edge, S7, S7 edge, S8, or S8 device up to 1.4x faster than standard wireless charging pads reducing total charging time from 0-100% by up to 50 minutes! Using Samsung's Fast Charge technology the pad can transfer a faster charge to the device when used with the included Fast Charge wall charger. The Fast Charge Wireless Charging Pad is closing the gap in speed between wireless and wired charging! The pad is also compatible for any Qi-enabled device so you can charge those devices wirelessly at standard speeds. Wireless Charging Pad, 2A Travel adapter, USB Cable, Quick Start Guide and Warranty Card.